Back in 1979 when I first started my practice, marketing meant having a good-looking sign on the door, a simple listing in the Yellow Pages and a small display ad in the local Pennysaver. Somehow those efforts filled my chairs with new patients. 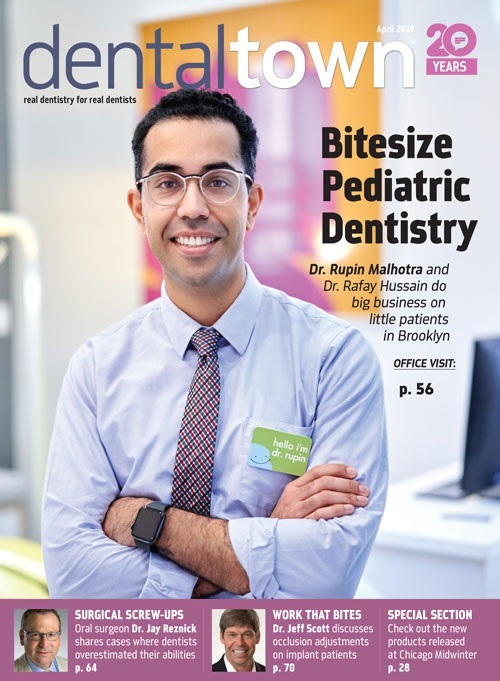 Today, dentists feel like they need a full-time marketing person to manage their directory listings, newspaper ads, Web page and search engine optimizations, radio, TV and general media presence, not to mention e-mail campaigns. The whole thing seems downright overbearing, and draining to devote a significant portion of the practice income, all before that new patient even sets foot in the door. With all these ways to market, it might seem that the last thing a practitioner needs is to be told about a new way to market their practice. But using Facebook – the ultimate social networking tool – will allow you to do many of the things you are currently doing even more effectively, with much less effort and significantly lower cost. 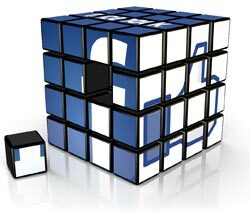 More than 500 million people are using Facebook worldwide. With more than 120 million in the U.S. alone, chances are good that nearly 50 percent of your current patient base is not only using Facebook, but is logging on several times a week. This is a tremendous opportunity to project your message and reinforce relationships with current patients, as well as tap into a market of new patients. The heart of Facebook's social network is the free page each person or business can set up, which can include photos, interests, personal information, and anything else they wish to include in their online persona. 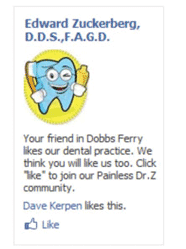 They link to other friends and acquaintances by inviting each other and accepting invitations to be linked online as friends, and to companies and businesses such as your dental practice's page by "liking" your business (formerly "becoming a fan" of it). Your page may include everything a regular Web page has – including articles, biographies of staff members, listing of hours, maps and directions, photos and videos. More importantly, the page is interactive. There is a "wall" on each page where fans can post comments, ask questions, review your practice and start discussion strings. With a little computer know-how you can easily set up the page yourself, or for a more professional look, use an outside company. The hardest part of developing your Facebook presence is getting existing patients and their acquaintances to "like" your page. According to Dave Kerpen, whose company Likeable Media (Likeable.com), specializes in helping businesses develop and grow their Facebook presence, getting fans for your page starts by listing your Facebook Web address (mine is www.facebook. com/painlessdrz) on your business cards, stationary, invoices, Web page, newsletter, office signage and just about anywhere that you have office information listed. Also offer incentives for your patients and other contacts to "like" your page. The incentive may be in the form of free merchandise, discounts on services, or special offers. People want to be involved and stay informed. Make them aware of your Facebook presence and with a little effort they will "like" and link to your page. According to Kerpen, the minimum magic number to shoot for is 350 fans on your practice's page. At that threshold the marketing effectiveness really starts to escalate. You can post simple updates to your page, which can range from introductions to new employees, information for patients about new techniques or equipment just placed into service, or the things you learned at the CE course you just attended. Better yet, use the page to ask engaging questions, and if possible share photos and videos of happy patients. These updates automatically get broadcast onto the news feed of all your fans in real time and free of charge! Unless you employ a company such as Likeable to help set up your page and strategy (I highly recommend it unless you have the time and are computer savvy), you haven't invested a dime yet, and you've developed a presence which will help you continue to tap into your market of fans with your messages as often as you want. This is a great vehicle to offer discounts and specials for your fans too. Around Valentine's Day, my page offered "free bleaching for your sweetie" when they came in for bleaching and purchased it for themselves. While you don't want to flood your fans' news feed with promotional messages, you do want to get your message in front of them as long as you have something worthwhile to say. Getting at least two messages a week is a good start and shouldn't take more than 10 minutes of your time to add new content to your page. Get your staff involved with ideas for posts, specials or even add an office blog to your page. Now that you have developed a nucleus of fans on your page, it's time to start attracting new patients to your practice. 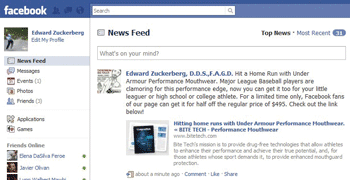 Facebook lets you target your advertising in ways that no other form of advertising can, and delivers the power of your fans' social networking connections to create the online version of word-of-mouth referrals. In Facebook's ad setup page you can select from a variety of demographics to target your market – including but not limited to: age groups, geographic locations, gender, academic levels achieved and any interest or job title listed on an individual's profile. Of course, the more specific you are in selecting demographics, the target market will decrease, but you will get more bang for your advertising dollar as you assure that your message is only getting out to those you want. Now here's the biggest kicker: one of the selectable categories is "friends of fans." For example, John Smith is a fan of your practice. Most people on Facebook have at least 100 friends, some upward of several hundred. Using demographic limitations, assume that 25 of John's friends fit into your limits. When your ad appears before John's friends on their Facebook page, there will also be a thumbs up graphic along with "John Smith likes 'your practice'!" This is the online equivalent of a word-of-mouth referral. Can you imagine if your direct mail could include references to the recipient's friends liking your practice? If that person is looking for a new dentist and they value John's recommendation, you have successfully harnessed a referral without having to ask John to be a missionary for you. Facebook also allows you to specify your advertising budget and gives you incredible tools to evaluate the effectiveness of your marketing program by giving you such information as number of impressions and number of clicks achieved. An impression is simply the viewing of your ad or its appearance on a page, with no guarantee they will see it or actually click on your ad. It would be the equivalent of a direct mail piece arriving in your prospective clients' mailbox. A click means they are interested or want more information, the mail equivalent of them actually opening the envelope. If you have done your demographic selection well, the click per impression rate will be much higher than any other form of advertising and accordingly, much more cost effective and efficient in generating new patients. I've done direct mail pieces that cost $500 or more, were mass mailed to 10,000 homes and generated four to five new patients on average. With Facebook advertising, an investment of $50 got me 120 impressions, 42 clicks and six new patients in one week. Your patients will be impressed by your Facebook presence as much as they are by that new CAD/CAM machine in which you just invested thousands. With Facebook you show you care enough to provide patients with a new means of communicating and staying in touch with them. As Facebook continues its exponential growth and your fans' network get larger, you are piggy-backing onto the best value in promoting your practice both internally and externally, reinforcing existing relationships and attracting new patients to your practice. Likeable's Kerpen calls Facebook "word-of- mouth marketing on steroids" – the sooner your patients "like" your practice, the sooner you can get those steroids working for you.